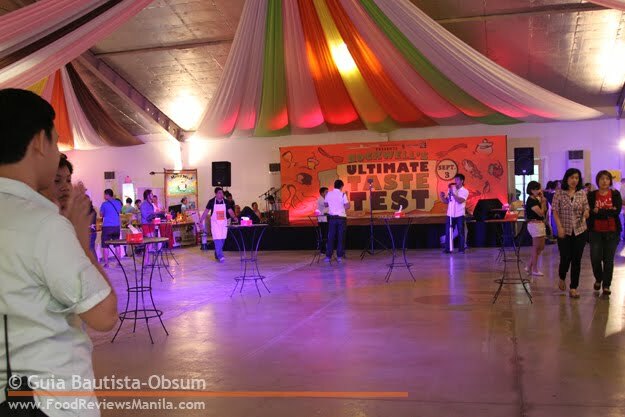 The Ultimate Taste Test, organized by Anton Diaz of Our Awesome Planet, was held at the Rockwell Tent this year. With over 50 food purveyors offering varied selections from main meat samplers to pastries and desserts, it's a gustatory temptation that's difficult to dismiss. We arrived before 11am and were the first ones in line at the entrance. It was my first time to attend such an event, though I'm used to frequenting food and lifestyle bazaars. The difference is that here, you get to be a food critic and have your say. As you present your ticket at the reception booth, you are given a UTT passport with a list of the food provisioners. In exchange for a sample of each fare, the supplier stamps your passport then you get to rate the food in the section provided at the back of the aforementioned passport. The one with the highest ratings gets to be featured in Anton's blog. Upon entering, there is a flurry of activity as participants apply some finishing touches to their displays. Being a UTT virgin, I stood irresolutely just beyond the anteroom, mentally calculating my strategy. After pondering for a few minutes, I decided to just take pictures of each booth first, row by row, then appraise the food after I've completed my shoot. I figured that way, I could concentrate on tasting and evaluating without lugging the heavy camera in one hand. The Concept Specialist Inc. offers coffee with different flavors under the brand of Caffe Chicco d'Oro. Luigi's is owned by Luigi Muhlach, son of Janice De Belen and Aga Muhlach. His mini menu consists of the Chicken Cordon Bleu and Phillychanga. For the cordon bleu, you have a choice of aligue mayo (which I had) or cream cheese for the sauce. I first bit into the phillychanga and as my teeth sank into the crispy tortilla wrap, morsels of tender meat and sweet, caramelized onions slathered with melted cheese greeted my palate. Why hello there, you are one tasty dish. And let's not forget the voluted ham and chicken, vermiculated with aligue mayo and garnished with chopped chives (?). The crackling sound from the crust is subdued more so because of its tenuity rather than its crunchiness. The result, a hodgepodge of textures that leaves a sapid taste in the mouth. This duo is definitely a MUST-TRY! I may have to put another emphasis on that -- this duo is DEFINITELY A MUST-EAT!! 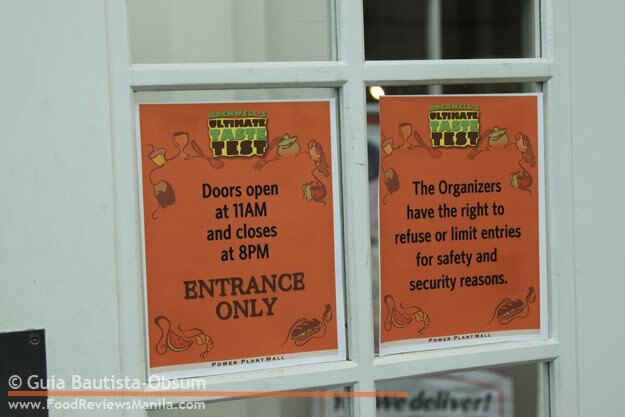 I seriously hope they will also have a stall in Soderno @ Molito. Sushi Mo had three different kinds of sushi, the California Maki, Tuna and Mayo, and Tonkatsu roll. The coiled rice enshrouding the different ingredients were visually unappetizing to begin with. The tuna and mayo sushi was redolent of a tuna sandwich as opposed to the classic tekka maki which is composed of a small chunk of raw tuna. The tonkatsu roll and the california maki were sadly forgettable. I don't actually remember tasting even a scrap of mango in the latter. Tina's Pie Outlet provides savory pies and tarts, and here they had Shiitake with Swiss Gruyere, Prawns Aligue (this is the one I tried), and Chicken with Chorizo. You'd think that a tiny bite such as these tarts would not allow you to savor its taste. Au contraire, these little ones pack a punch. At least the prawns aligue do. That saporous crab fat had me dreaming contentedly in a cholesterol cloud for a minute. Can I have another one please? Apart from this, they also have Callos in a round foil pan, a luscious brown clad in a sheen of oil and fat. If the other pies resemble these two in terms of flavor, then I would love to try them all. Big Daddy Jay's All American Barbeque BBQ dished out Smoked Pork Ribs. This is one viand I regret not trying. I should have poked those two-tined plastic utensils on those juicy-looking ribs when I had the chance. Purple Mustard Food Solutions had Fried Ravioli with Rosemary Honey. Joy's Fuzion Kitchen purveys the Grand Pianono and Crispy Chicken Wings. PinakBEST regaled the foodies with Bagnet, Chichacorn and Empanada. Alas, the latter was nowhere to be found when I was at their booth. Fortunately, the piquant bagnet, which sat at one side of the paper plate, skewered right in the middle and dredged with mouth-watering ensalada, more than made up for a loss. StopOver Pizza and Pasta offered a choice between the Four Cheese Pizza or the Terimayo Chicken Pizza. Yoh-Gee Premium Frozen Yogurt comes with three different flavors of kefir, which is supposedly more beneficial than yogurt due to additional strains of friendly bacteria and beneficial yeasts. Swirls of pastel pink dotted with delectable strawberries tempt and titillate, while a bed of pale yellow frozen goodness adorned with diced mangoes entice and enthrall. Another dessert without the guilt! This is just the beginning. Watch out for more scrumptious edibles in my next post. oh! i wish i could have come here! i didn't know there is such an event...was it by invitation only? would you know if there will be another UTT? wow... everything looked great. I got curious about the aligue mayo... sounds yummy (and unhealthy). I'm so jealous! I wanted to go to this event for the longest time but I'm always unable to..
"Swirls of pastel pink dotted with delectable strawberries tempt and titillate, while a bed of pale yellow frozen goodness adorned with diced mangoes entice and enthrall." -- wow, poetry in a blog entry!!! We love how you described Yoh-gee's frozen kefir! :) Thanks for the feature! OMG. I LOVE your photos! Reminds me of how delicious the food were at the UTT. It was nice meeting you there! I follow your blog and I'm usually good with faces, but for some reason, I didn't recognize anyone except the other foodies I've already met in the past. Kalokah!